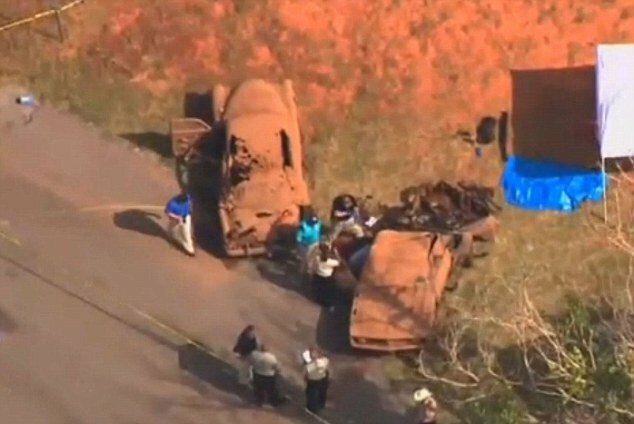 The discovery of two rusting vintage cars containing six bodies under Foss Lake in Oklahoma has reignited the mystery of how three teenagers and three other people vanished in 1970. Highway patrol officers testing their sonar equipment Foss Lake near Elk City, Oklahoma on Friday stumbled upon the rusting 1969 Camaro and a Chevrolet dating back to the 1950s. Inside the Camaro were three bodies believed to be of local teenagers who vanished after going out for a drive in 1970. Inside the Chevrolet were three more bodies – thought to be a 69-year-old man and his two friends who went missing in the state in the late 1950s or early 1960s. Police say the Camaro matches the vehicle associated with the three missing teenagers who disappeared on November 10 1970. They say they have confirmed the identity of at least one of the victims however details are yet to be released. Authorities have not formally identified all of the remains belong to but the local paper has made a clear connection between the discovered Camaro and the teens. The latest reports by local station KFOR states that one of the victims in the car thought to have belonged to the teenager has been identified but they are waiting to notify all of the relatives of the victims involved before releasing any names. Jimmy Allen Williams 16, Thomas Michael Rios, 18, and Leah Gail Johnson, 18, all went missing after going for a drive in Jimmy’s blue 1969 Camaro on November 20, 1970. They are still listed as missing persons and were thought to have been headed to a football game in nearby Elk City but also could have detoured to go hunting at Foss Lake. “It’s just been under water for 40 years. It’s a mucky mess,” Custer County Sheriff Bruce Peoples told KWEY radio. In addition to the Custer County Sheriff’s Department, the Oklahoma Highway Patrol, the Oklahoma Bureau of Investigation, and the state medical examiner’s office were on scene Tuesday. Authorities discovered the accidentally as Betsy Randolph, spokeswoman for the Oklahoma Highway Patrol, said dive teams were at Foss Lake conducting training with sonar when they came upon the vehicles last week. “So they went back and did a scheduled dive today and were going to recover the cars. When they pulled the cars out of the water, the first one that came out they found bones in the car,” she said. When they pulled the second car out, another set of bones was discovered. The divers then went back in the water and searched around and found a skull, she said. The remains were turned over to the medical examiner’s office who are expected to use DNA from surviving family members to identify the skeletons. “We thought it was just going to be stolen vehicles and that’s not what it turned out to be, obviously,” Betsy Randolph said. Custer County Sheriff Bruce Peoples said he believes the bodies found in the Camaro are those of the three teens who went missing in 1970. Local woman Kim Carmichael was a friend of the Camaro’s owner, 16-year-old Jimmy Williams. She told Oklahoma’s Newsnine.com: “I just remember how devastated everybody was. At the time of the disappearance, Kim Carmichael’s father was the undersheriff in nearby Beckham County where the teens were last seen. He died in 2003 never knowing what happened. Kim Carmichael added: “He said there was nothing … There were no leads, no nothing. He said it was just like they vanished into thin air. Oklahoma Highway Patrol said they are hoping the discovery will offer some relief to families who may have gone decades wondering where a missing loved one was. The medical examiner had called a number of relatives of possible victims to the scene, many of whom said that they never lost hope. “We never gave up. We always wanted some clue that somebody knew someone,” said Debbie McManaman, a possible victim’s granddaughter.